Have you overworked your knee joint? Suffer from osteoarthritis or cartilage damage? Our Hinged knee cap might be something you should take a look at. It provides compression, warmth and improves blood flow to the soft tissue areas surrounding the joint. Splints present on the sides, ensure enhanced support and stabilization. 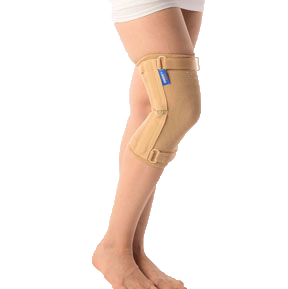 The hook & loop straps provided above and below the knee allow for optimal support. The side supports are moulded in fibre making the product lightweight. The cotton knitted fabric releases sweat and permit airflow, which its ergonomic design ensures a two way stretch.